TPC Overall Rank: #58 out of 2933 rides. In User Top 10: 58 times. User Tracker Count: 141 times. Loved it! 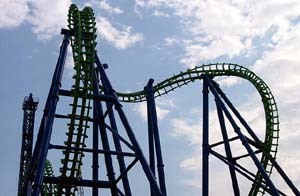 I loved the Deja Vu at Six Flags over Georgia and I was glad to ride it. The line was around 45 minutes and worth a ride. I miss it in Georgia. I have a sit down boomerang at my home park, but the inverted style blows it away. I sat in the back and thought the backwards ride up the vertical spike was fairly comfortable and a heck of a view. Upon release you fly through the station and through the three inversion elements. The backwards trip is great and unique. There is some head banging which is a drawback to this ride, but its not near as bad as its SLC cousin. Also, the seating arrangement in a V shape is confusing to most riders and leads to slower loading in the station. Overall, a great ride with plenty of excitement. 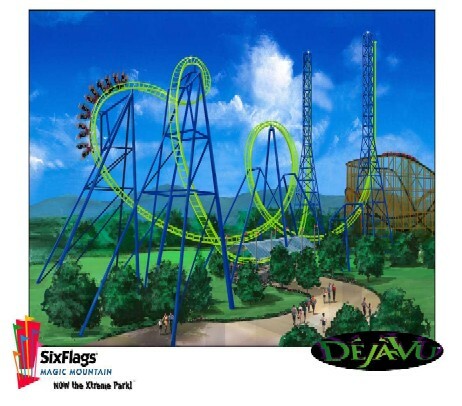 I really enjoy Deja Vu at my homepark, and after several visits to the Southern California installation, I got my chance to ride one not at my home park. It ran as well as I had ever seen my homeparks run which was nice, and it was humerous to ride with a 68" fella whos feet were held up by another friend (not recommended). The spikes are still cool, the backwards part is still insane and overall I really enjoy my rides on Deja Vu, and am glad I can finally walk away from the park having ridden it. It is extremely fun. You have to go at night. The effect is so much better. Its amazing knowing that youre completely vertical, and that you are about to fall back. Some people say that it bangs your head around alot, but my head felt just fine when i came off. All i felt was happiness. These are really cool but the fun wears off quick. 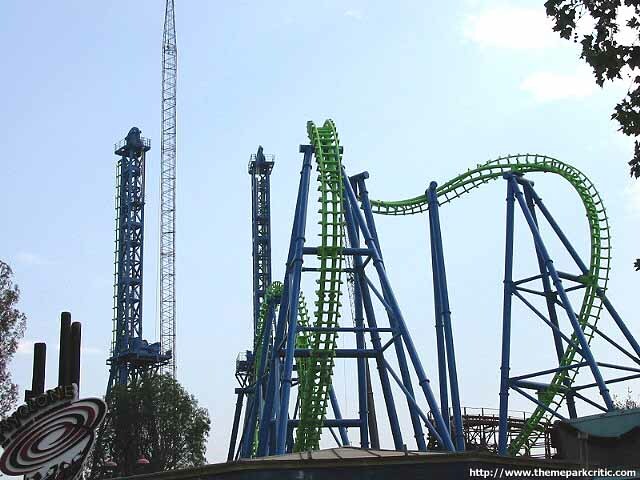 It seems like every Six Flags has one. It just isnt unique enough any more. It is a good ride, not a great ride. Great ride, the best one-car roller coaster in Southern California. I would give it a 10, but the fact that it is closed a lot drops it down a point. 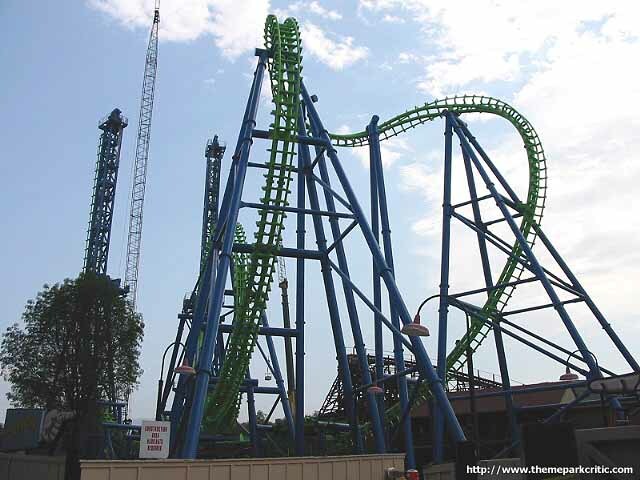 It also still doesnt compare to Great Americas Face-to-face coaster, Invertigo. Too bad people over 64" cant ride it. 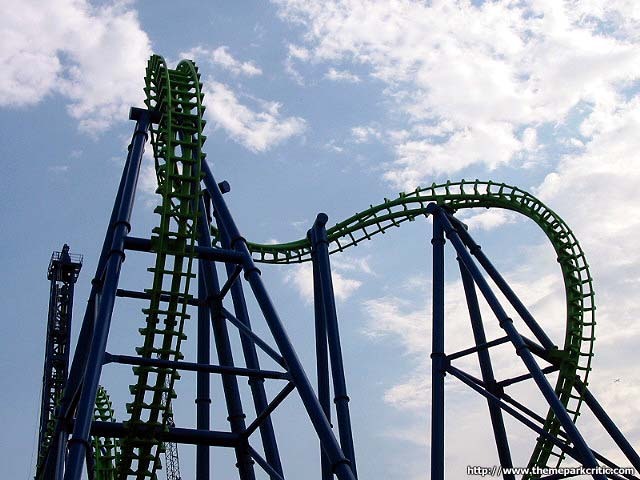 This is my second favorite ride at Magic Mountain, behind only X. I like the standard boomerang coasters okay, but would never put them anywhere near the top of my favorites list. This, however, is no standard boomerang coaster. Who knew you could teach an old ride new tricks? 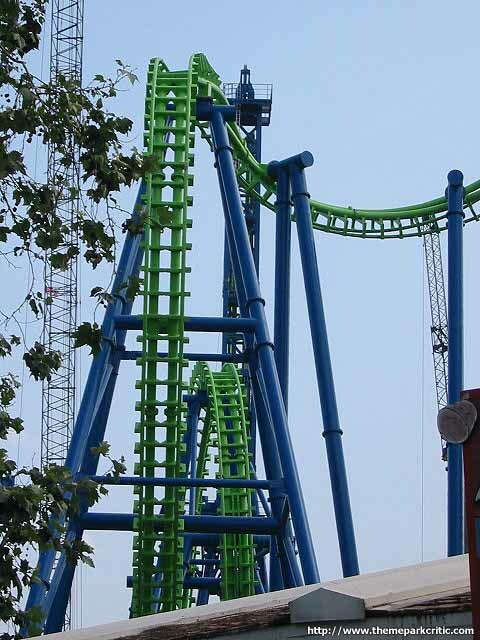 This is a mega inverted boomerang, with the two towers being completely vertical. While riding, they feel beyond vertical. It is one of the most bizarre sensations hanging straight down as you are pulled backwards up the first tower, and you really appreciate your safety restraints, as all of your weight is pressing against them. The straight down drop is gut wrenching (I love that! ), and then you do the usual boomerang moves before going straight up the other tower. This is eerie as well. Backwards is of course awesome, but one of the best, most underrated parts of this ride is the very end, where the train goes back through the station and half way up the first tower again, where the brakes kick in and you are just suspended there, all of your weight in the restraints again, as you are slowly lowered back to the station. Deja Vu is super intense. I would classify this as one of the freakiest coasters anywhere.